BNSF’s Technology Awareness Day is part of the National Black Family Technology Awareness Week. The national campaign was started by IBM, and aims to “promote significant minority achievement in engineering, science and technology.” Corporate-sponsored events are held nationally during a week in February. BNSF began hosting the event in 2004, and attendance has grown every year. At BNSF’s Fort Worth headquarters’ campus. The one-day event is a local version of the campaign that aims to educate local minority youths about careers in the technology field and challenges attendees to design and develop their own technological solutions that are judged at the event. 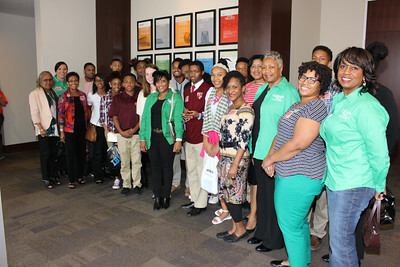 The Fort Worth (TX) Chapter Links, Incorporated own Empress Program and Kappa League participants were among several guests.